Fishing is perfect for those looking for something different than the usual weekend away, but still with enough thrill and goals to get your adrenaline pumping. If you’ve never been fishing before then this is a superb first experience that’ll see you throwing your own lines, bonding with the group and bringing in the catch of the day (hopefully). It's a cracking activity and it's a great way to keep the group together and entertained. 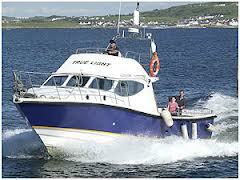 The fishing vessel operates out of Liscannor Bay (Located 2 minutes drive from Lahinch). The route takes in views of Cliffs of Moher and Aran Islands. The waters at the foot of the Cliffs of Moher which rise over 200 meters from the Atlantic Floor, are a very popular area. All the coastline provides wonderful vistas from the sea. Regular catches include above average size blue shark, white pollock, ling, ray, tope and coley. All rods, reels and bait will be supplied.